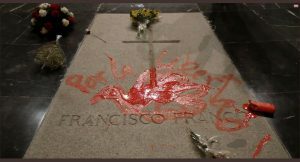 A Spanish artist, Enrique Terneiro, painted a red dove and the slogan ‘For Freedom‘ on Francisco Franco’s tomb on Wednesday, at the vast mausoleum near Madrid where the late dictator is buried. The incident came amid debate in Spain over where Franco’s embalmed body should be relocated after Prime Minister Pedro Sánchez’s socialist government carries out its plan to exhume the remains. 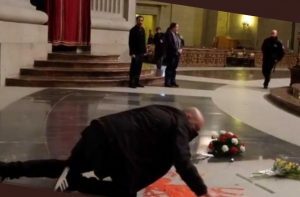 In video images broadcast on Spanish TV, a security guard is seen escorting artist Enrique Terneiro away from the grave after he had knelt down and scrawled on it in red ink. Franco’s remains are buried in an imposing basilica carved into a mountain-face at the sprawling Valle de los Caidos (Valley of the Fallen) mausoleum just 50 kilometres (30 miles) outside the Spanish capital. ‘For freedom and the reconciliation of all Spaniards,’ Terneiro can be heard shouting as he is led away from the scene. Terneiro, a sculptor and video artist, is known for provocative acts, and once rode in a glass elevator sitting on a bidet. 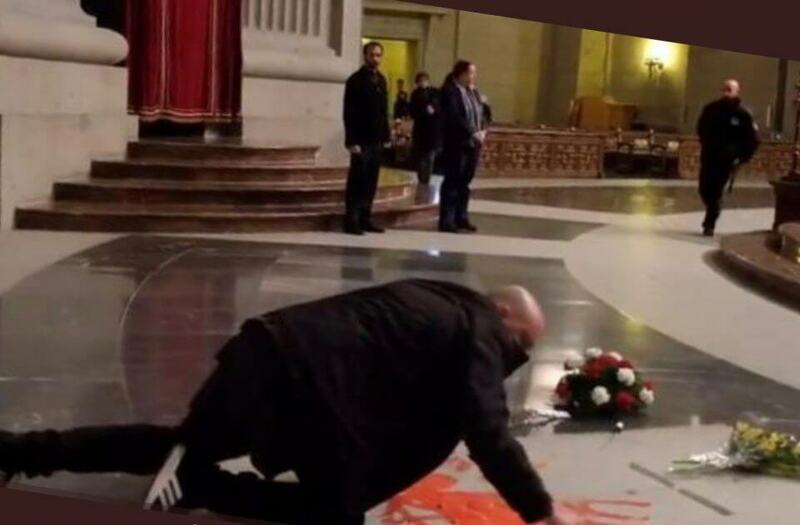 Spain’s National Heritage Agency, which runs the Valley of the Fallen, said the artist ‘had brought the paint into the basilica in a plastic container which cannot be detected by current security systems’. Terneiro, 49, told daily newspaper El Mundo he painted the red dove on the tomb as a ‘protest action’ for the ‘freedom’ that was ‘stolen’ from his parents’ and grandparents’ generations. ‘It’s my little grain of sand, I hope it alleviates the pain of the losers of the civil war,’ he added. A spokeswoman for Spain’s Guardia Civil police force confirmed an investigation was under way. The Valley of the Fallen holds the remains of more than 30,000 dead from both sides of the 1936-39 civil war triggered by Franco’s rebellion against an elected Republican government. He went on to rule Spain with an iron fist until his death in 1975. Sánchez, who came to power in June, wants to move the former dictator’s remains to a more discreet spot where it will be harder for Franco followers to pay homage. Lawmakers in September approved a decree authorising the exhumation. But Franco’s family, which opposes the move, wants to inter his remains in a family crypt at Madrid’s central Almudena Cathedral, next to the royal palace.